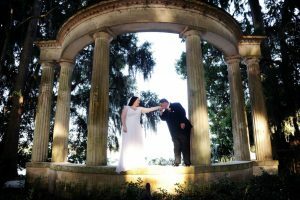 Brittany and Jay decided on a garden wedding for their destination wedding to Central Florida. Kraft Azalea Garden is nestled in a quiet neighborhood on the shores of tranquil Lake Maitland in Winter Park, Florida. Just minutes away from the hustle and bustle of the busy city, this is a great oasis of tranquility. With bald cypress trees that predate our nation, snowy egrets nesting in the branches above you, and the occasional tour boat behind you, this is a wonderful escape from the hustle and bustle of city life. Coming from Massachusetts the couple enjoyed the breeze and shade that flowed over them and kept them cool on such a warm day. Flowers by Lesley crated an amazing fall bouquet for Brittany. With Zinnias, amber daisies, and the red berries of St.John’s Wart this fall bouquet and matching boutonniere were absolutely stunning. Victoria with Intimate Weddings of Orlando took care of all the details. From booking the garden, ordering the florals for the bride and groom, to arranging a great vendor team to assist the couple; took care of it all. Congratulations to Jay and Brittany! We wish for you a lifetime of happiness and love.